Estas fotos fueron un encargo de la Hispanic Society a la fotógrafa Ruth Matilda Anderson que recorrio toda España con su cámara. La fotógrafo recorrió pueblos fotografiando a sus gentes en su entorno cotidiano, dentro de sus casas, haciendo sus labores normales. Pero, además, hizo las fotos de manera profesional, bien compuestas, muchas de ellas parece o aparece la mano del fotógrafo en la colocación de la gente, muchas veces algún protagonistas mira directamente a la cámara o, a veces, desde una ventana, que aparece en la foto, mira a los protagonistas de la foto sin saber que él también es parte de la misma. Estas fotos que documentan un pasado lejano-cercano ( contado por nuestros abuelos) cumplen una función documental, muchos de estos lugares, oficios o materiales de trabajo han desaparecido y eso hace que la gente se acerque a ver estas exposiciones. Así cumplen la función de documento de la foto, historia de la vida, como de atracción de la gente hacia la fotografía antigua, hacia la valoración como documento, historia viva y de la foto como valor, por sí misma, de valor artístico. Las fotos, copias actuales, fueron realizadas por Castro Prieto lo cual es garantía de calidad. 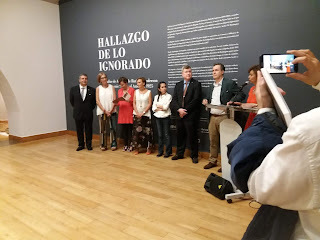 Con esta exposición de fotos la espléndida labor divulgativa de la Hispanic Society se amplia pues fondos suyos ya los vimos en otras exposiciones con fondos de otras comunidades. Recordar que la exposición se presenta en dos sedes: Instituto Jovellanos y Museo Casa Natal de Jovellanos. 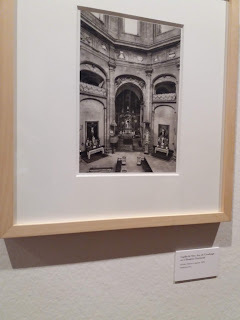 La fotografía en los fondos de la Hispanic Society of América: Ruth Matilda Anderson. These photos were commissioned by the Hispanic Society to the photographer Ruth Matilda Anderson who toured all of Spain with her camera. The photographer toured villages photographing their people in their daily environment, inside their houses, doing their normal work. But, in addition, he took the photos in a professional manner, well composed, many of them seem or appear the hand of the photographer in the placement of people, many times some protagonists look directly at the camera or, sometimes, from a window, which appears in the photo, looks at the protagonists of the photo without knowing that he is also part of it. 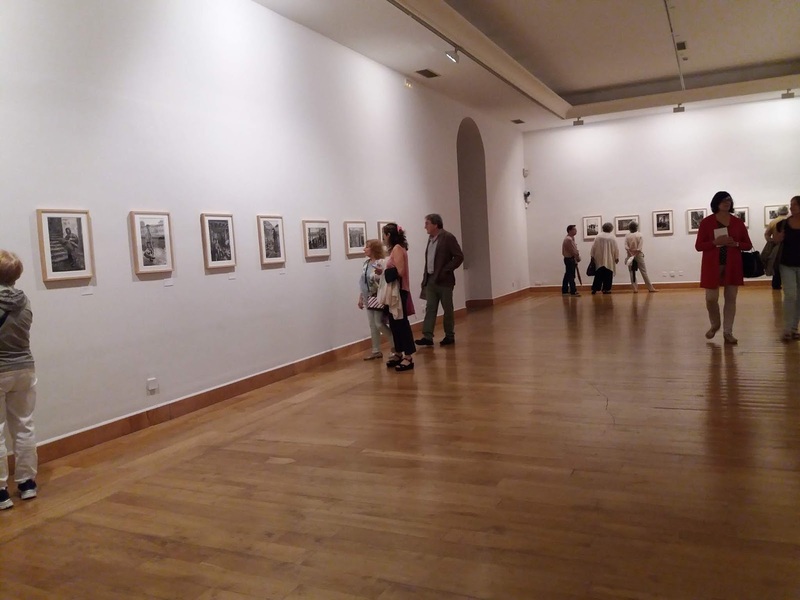 These photos that document a distant-near past (told by our grandparents) fulfill a documentary function, many of these places, trades or work materials have disappeared and that makes people come to see these exhibitions. In this way, they fulfill the function of document of the photo, history of life, as of attraction of the people towards the old photography, to the valuation as document, living history and of the photo as value, by itself, of artistic value. The photos, current copies, were made by Castro Prieto, which is a guarantee of quality. With this exhibition of photos, the splendid informative work of the Hispanic Society expands its funds and we saw them in other exhibitions with funds from other communities. Remember that the exhibition is presented in two venues: Jovellanos Institute and Museo Casa Natal de Jovellanos. ........... In her image of a Galician milkmaid, Anderson photographed a barefoot girl holding a milk jug. While the image portrays the austerity of that child's life, Anderson also projects a tempting feeling of commiseration for the girl in the image. The balance between objectivity and compassion characterizes the best of Anderson's work and it is surprising that, even when he documents anthropological issues, he composes the scene with great skill, undoubtedly encouraged by his training .......... .